Get your Trailhead Playground username and password. Most of the time, you won’t need to know the username and password of your Trailhead Playground. When a Trailhead Playground is linked to your Trailhead account, you can launch it with the click of a button, without logging in. You don’t even need to choose a username or fill out any information to create a new Trailhead Playground. You do need your username and password every once in a while, however. For example, if you’re installing an app or managed package to your Trailhead Playground. You’ve probably reset your Salesforce password, or one of your user’s passwords, before. Don’t skip this step though—there’s only one way to reset your Trailhead Playground password. Let's take you through that method. Launch your Trailhead Playground by clicking Launch from any hands-on challenge. Enter Users in Quick Find and select Users. Locate your name on the list of users. Check the box next to your name. Make note of the username. This is the username for your Trailhead Playground. Click Reset Password(s) and OK. This will send a password reset email to the email address associated with your username. Be sure to check your spam folder if you don't see the email. Now you have your username and password for your Trailhead playground. Write your username and password down to keep them handy—especially if you’re planning on creating multiple Trailhead Playgrounds. For additional tips and to see this process in action, check out this video. Once you’re a seasoned Trailhead user, you might have more than one Trailhead Playground. Say you’re completing a superbadge, for example, and you want to start clean in a new org. Or maybe you have an existing Developer Edition org that you want to connect to your Trailhead account. 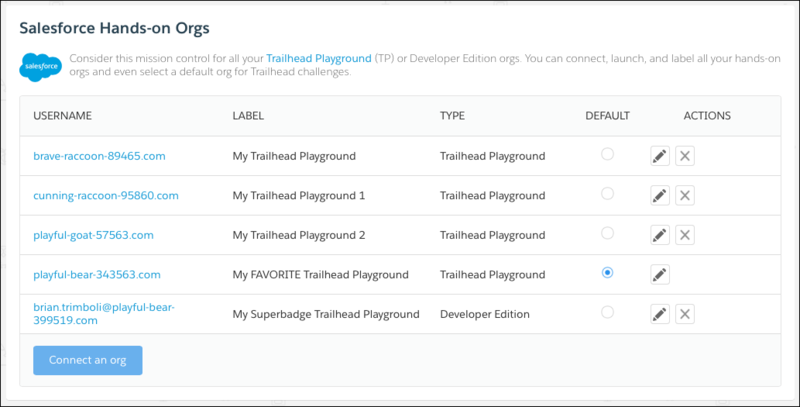 You can connect, disconnect, or rename your Trailhead Playgrounds to keep yourself organized. From any hands-on challenge or project step, click the dropdown and click Manage my hands-on orgs. From here, click the next to one of your Trailhead Playgrounds to rename it, or the to disconnect it. To connect a Trailhead Playground or Developer Edition org, click Connect an org. You can name your Trailhead Playgrounds after anything: Your cats, members of your favorite basketball team, characters in your favorite Jane Austen novel, or whatever you want. To set an org as your default, select Default. When you click Launch from a hands-on challenge or project step, it launches your default org, unless you choose otherwise. Don’t, however, change the username of your Trailhead Playground. Although your.name@brave-racoon-89675 (or whatever your username is) doesn’t exactly roll off the tongue, changing it can complicate things down the road as you complete more challenges and projects.